Relais Paradiso, 5 star accommodation in Amalfi's coast, offers all the comforts of a 5-star hotel in each of the 22 rooms, divided in Suite, Junior Suite, Deluxe and Superior. All rooms have spacious bathrooms with whirlpool and / or shower, private terrace with a wonderful view over the green mountain landscapes (superior and deluxe rooms) or private balconies overlooking a stunning portrait of the Amalfi Coast (deluxe sea view). The Junior Suites and the Paradiso Suite offer cozy living rooms and outdoor whirlpool on private terraces; the Paradise Suite also features a revolving circular bed, an indoor whirlpool and a precious sky ceiling starry effect in the dark. Relais Paradiso, 5 star accommodation in Amalfi's coast, gives the chance, to families with children, of staying in spacious rooms equipped with sofa bed. The deluxe sea view and sea view suites can accommodate up to 4 people in comfortable sofas. The relais thinks as well to the behave of your family offering you connecting superior or deluxe sea view rooms. Private holiday home, a 5 star accommodation in Amalfi's coast, surrounded by the lush landscape of Mediterranean flora, this is what Relais Paradiso wants to be. With panoramic and breathtaking view of the village of Vietri sul Mare and of the Amalfi Coast, the relais wants to be the ideal answer to who is looking for intimate and secluded haven without renouncing comforts and services of a 5 star hotel. Moreover, for the first time a private Chef will be at complete disposal of his guests in order to satisfy their wishes: every day he will agree with them upon the menu choosing the products offered at the moment by the season and the market. 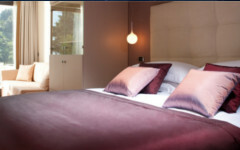 Enjoy your stay at the Relais Paradiso, 5 star accommodation in Amalfi's coast.